I watched a leaf fall today. No, I mean I really watched it. With the bluest of skies serving as a brilliant backdrop, this bright, yellow leaf softly floated in slow motion like the feather riding the wind in the opening scene of Forrest Gump. I couldn’t look away; I wanted it to complete. Finally, it came to rest on the street where it was promptly swallowed up in a swirling burst of autumn wind. I walked away thinking about change. I thought about my daughters and how fast they’re changing. Is it possible, I thought, to walk down resistance road while—at the same time—being thankful for this season? There’s a door in my house that serves as a potent reminder of what time is capable of. Every few months or so, we stand our daughters up against it to measure their growth. We’ve only lived there for six years yet there it is, as clear as red and black magic marker ink; change. We talk to them like they’re adults. Together, we confront what is bad and encourage what is good. We remind them that we are their guard rails and that along with change comes pain. We answer their questions. And we tell them every day that they are so loved. I am blessed with an incredible memory. It’s a mixed blessing. I remember being 12 like it was last wednesday. I envy and hurt for my girls at the same time. You might remember, the troubles of youth often feel more like a hurricane slamming ashore than a harmless swirling breeze on a sunny, fall afternoon. Today, after a long run, I am resting. I am thinking about what’s ahead for them—what’s ahead for me. I wonder if God is happy with my change. I wonder what my magic marker ink looks like. 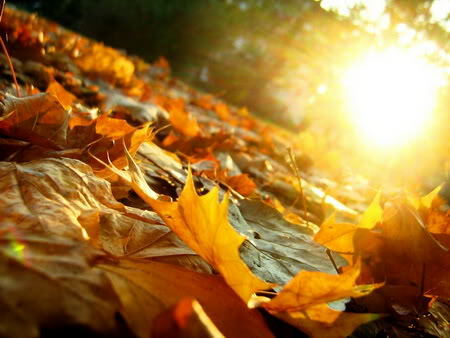 I glanced back at where that leaf got caught up in Autumn’s hasty churn… And I thought about change. Resistance road may be the path often traveled, but it’s not the preferred route. Because, as the classic song promises, A Change Is Gonna Come. Better to thank God for the blessings. Better to ask for guidance in the midst of inevitable winds of change. Better to accept autumn’s gift.